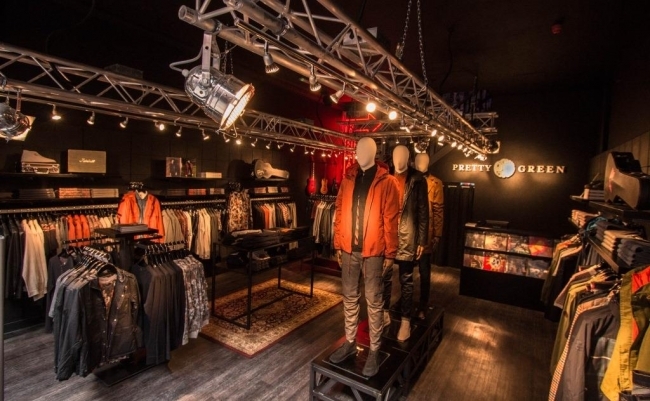 Pretty Green, the menswear retailer, has announced the relaunch of its newly refurbished store in the Victoria Quarter in Leeds, which opened to the public this week. Victoria Quarter is an upmarket shopping area located in the centre of Leeds, home to more than 70 of the world’s leading fashion & lifestyle brands. With this relaunch, Leeds has become Pretty Green’s biggest store and will stock the entire range of Green Label, Black Label, Shoes & Accessories as well as the Hendrix collaboration collection. It will also be the first store to have a new Black Label boutique area on the first floor. Pretty Green started trading in Victoria Quarter in June 2012 and following four years of strong trading, management invested in refurbishing the store to support its continued growth. The investment enabled an increase in total floor area to 1600sq ft. from 1200sq ft., creating a second floor level. The second floor has been re-designed and now incorporates truss rigging lighting, authentic Pretty Green fly-postering and neon signage, uniquely echoing Pretty Green’s brand values influenced by its rock ‘n’ roll heritage. To celebrate the relaunch of the store, Pretty Green will be hosting an acoustic gig by the Fronteers band on 29 September and an in-store art exhibition showcasing pieces created for ART IN A CORNER, a 50th anniversary project inspired by Images of a Woman, the only known painting ever made by The Beatles, painted in Japan in 1966. Richard Ralph, Pretty Green CEO, said: “We are delighted to relaunch our Leeds store today, now the biggest in our growing stores portfolio and the first to include our new Black Label boutique area. We believe the store truly represents our brand ethos of combining the love of music and fashion.